Juneberry Lane: Guest Book Brilliance . . . Guest Book Brilliance . . . Ever wonder if there was a way to keep your wedding guest book from assuming the role of dust collector on the bookshelf once the vows have been said & the honeymoon has been had? Well, thanks to Wed Loft, these charming alternatives to the run-of-the-mill old pen to page in in a book deal will offer your guests a fun & creative way to express their well wishes, without all of the writer's block that goes into thinking up the standard 'Congratulations, wishing you a lifetime of happiness' . . . Wish Paper Basket - This is a really cool idea! 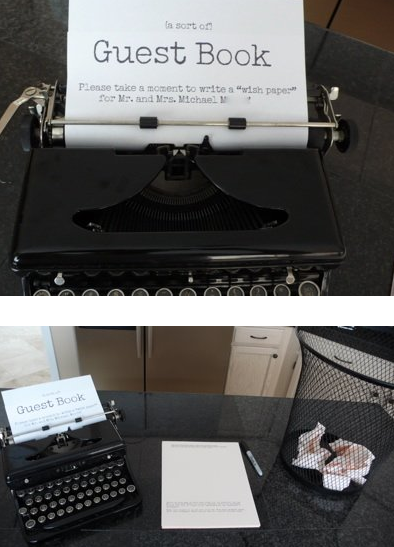 Simply stage a vintage typewriter, a pre-typed piece of paper with instructions (so your guests know what to do), and a waste paper basket. 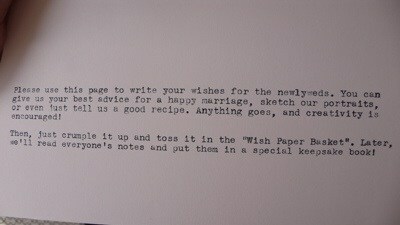 Place a stack of paper next to the typewriter for your guests to write their well wishes, marital advice, recipes, etc. on. Your guests will then crumple them up and toss them into the basket. Tip: Have a few crumpled up sheets in there already, to show guests that you really do want them to crumple their pages up and throw them in! 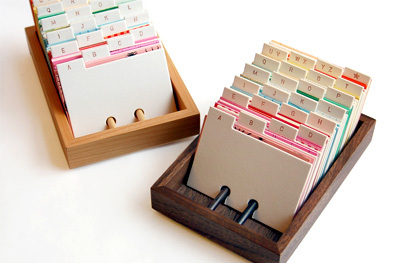 This is a different take on a rolodex project found on the Brooklyn Bride Blog. 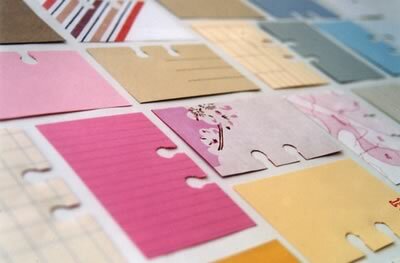 Instead of using a rolodex for seating cards, the rolodex could be used for guests to write a message to the bride and groom, along with their current address. Guests would then file their card away under the corresponding letter. This is definitely one of the sweetest guest book ideas that I've ever seen! 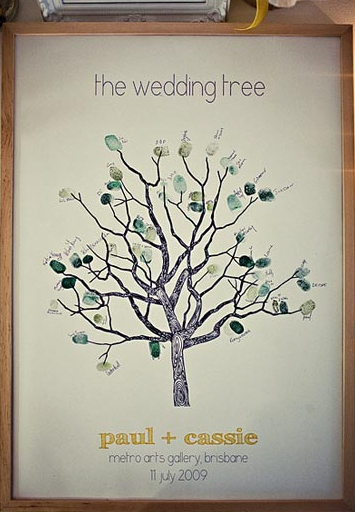 All you have to do is draw a tree with lots of empty branches on a poster, then put up a sign asking guests to “leaf” a fingerprint, along with their name. Why not turn all of your engagement photos into a book to be signed by your wedding guests? 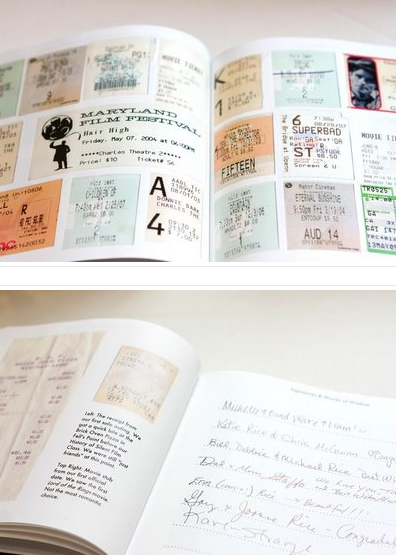 You could also include other relationship memorabilia, such as movie and concert ticket stubs, etc. You can create a hardcover photo book on blurb.com for as little as $24.95. Here’s an awesome idea from welovelaughkiss.com. 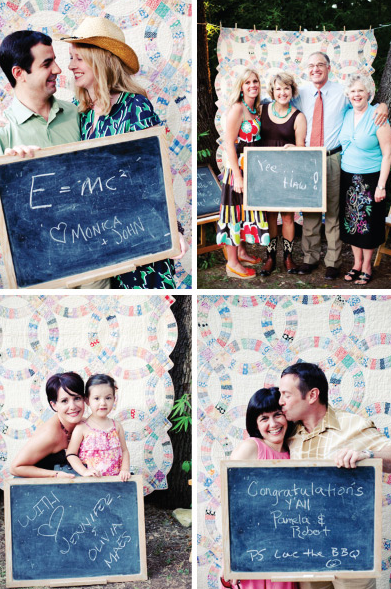 Simply hang a patterned cloth or other backdrop to serve as a makeshift photobooth. Provide your guests with chalkboards and chalk and leave a sign instructing them to write a message and take a picture with it. You’ll have great photos of your guests, along with sweet messages, to cherish for a lifetime! Simply place some branches from a cherry blossom, manzanita, or magnolia tree in a pot. 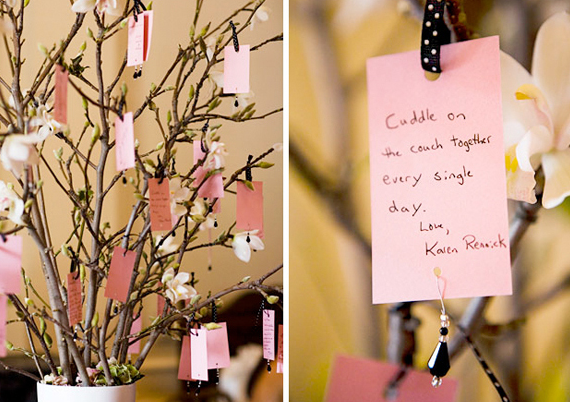 Attach ribbons to cards and ask guests to write their well wishes or advice and hang the cards on the branches. This idea, from loveandlavendar.com, is one of the cutest ever! Simply write instructions on a detergent bottle asking guests to “air out their dirty laundry” by writing funny stories about the two of you on little cards shaped like pieces of clothing. 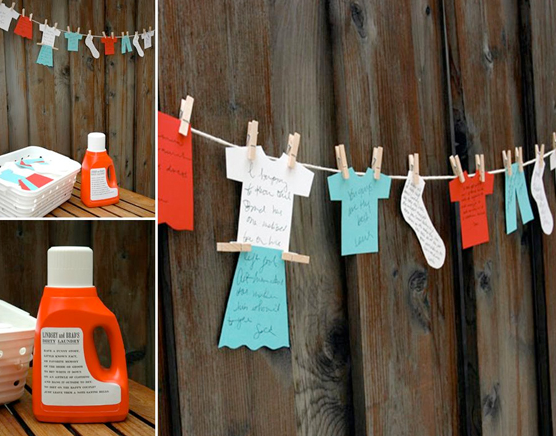 Provide guests with clothespins to clip their cards onto a clothesline. Love it! I just adore this idea found on marthastewartweddings.com. 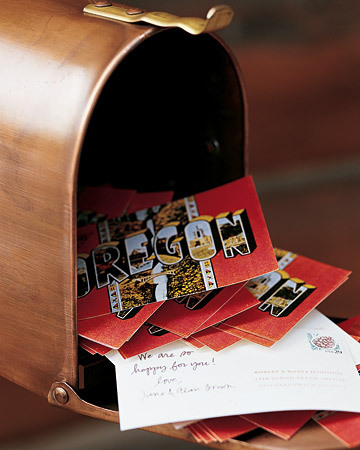 Rather than signing a traditional guest book, guests at this wedding were given postcards, with the bride and groom’s address printed on the back, to fill with good wishes during the reception and drop in a copper mailbox displayed in the lobby. The cards were then mailed the next day by a friend so that the newlyweds would return from their honeymoon to a mailbox overflowing with love! Here’s another great idea from Martha Stewart! 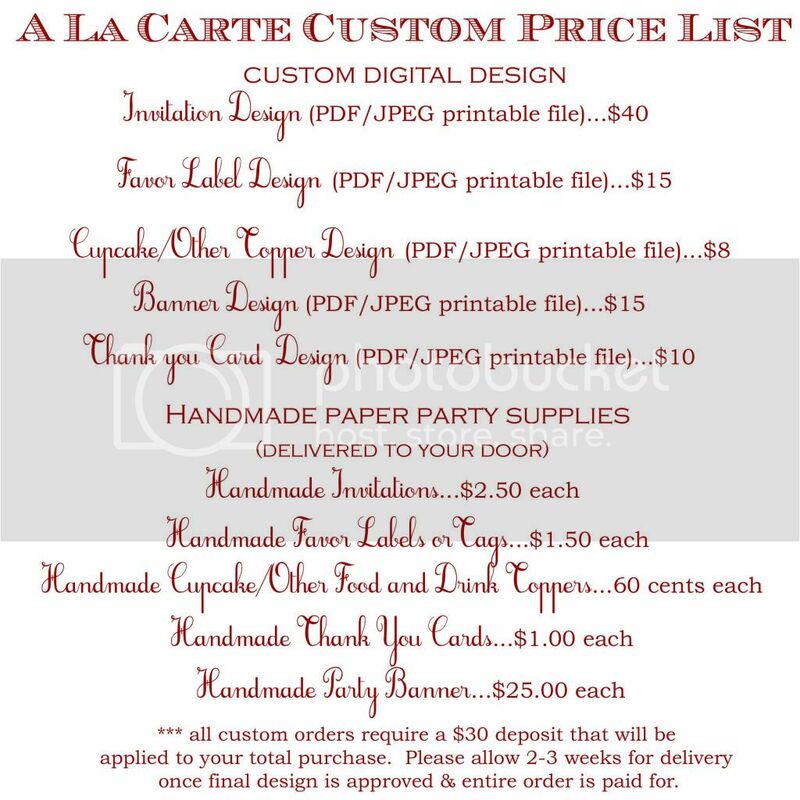 Want to ensure you have the birthdays of all of your friends and family? 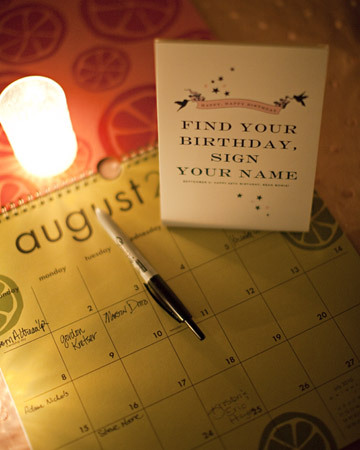 Place a calendar at the reception and ask guests to print their names on the appropriate date on the calendar. Aren't these just the most unique guest book ideas you've ever seen? LOVE them! And thank you to a fabulous future guest blogger, my lovely little sister, Meggie, for sending them Juneberry Lane's way! A Weekend Treat: Mini Ruffles . . .
A Dream Home Tour: Part 5 . . .
Harry Potter Butter Beer & Broomsticks . . .
Disney Pixar's 'Up' Inspired Wedding . 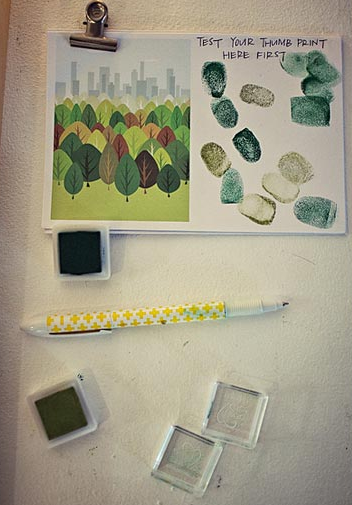 . .
A Dream Home Tour: Part 4 . . .
Woodland Party Invitations & Labels . 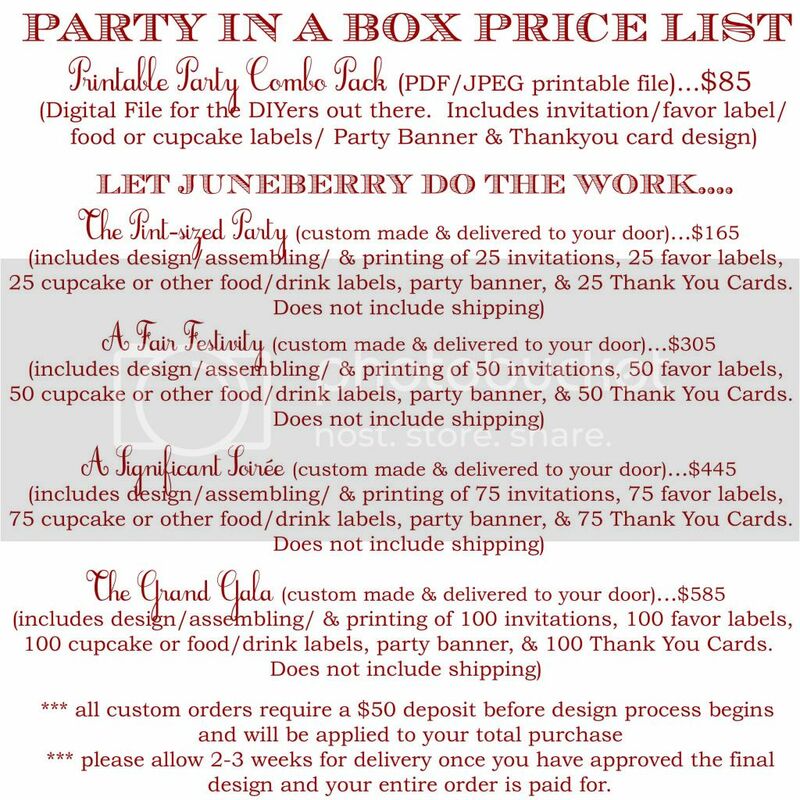 . .
Juneberry Baby: Woodland Party Inspiration! Tutorial Tuesday: Paper Circle Garland . . .